The Fat Controller, also known as Sir Topham Hatt, is clearly the undisputed ruler of the Island of Sodor, despite the title of the series being Thomas the Tank Engine. It is the Fat Controller who curbs overconfidence and free-thinking. He admonishes for causing confusion and delay. He makes them run errands (picking up his granddaughter) – how is that Really Useful? Does she not have her own train to boss around? And more, when James is picking up the granddaughter, he is only halfway through a new paint of coat, as ordered by the Controller – so he must go out whilst pink, and all the engines make fun of him. Whilst, of course, the turning upside down of gender norms should be congratulated, it ought not to be forced upon one, and certainly shouldn’t be mocked and decried by other engines. Sodor is an island nation of top-down governance, completely male dominated. Dissent is punished. There’s a very ‘joking’ yet punishing ideology, with lots of teasing name calling (lazybones). The Fat Controller controls medicine (the paint jobs), as well as access to bathing. Necessities are doled out as rewards for good behaviour. Who is the Fat Controller? Is he working for an organisation, or is he merely a despot? We speculated on the role of Sodor as Prison Island – if we had a platoon of troublesome, feeling and thinking trains, we too would secure them to an island and keep them distracted and occupied with busywork. What kind of dystopic hellscape is led by a dictator called the Fat Controller? Steph thought this was a sign of the fatphobic nature of Sodor. Liz would like to argue that the Fat Controller is in fact a fat positive figure, in that he owns his fatness and makes it part of his identity (whilst, admittedly, using it to distract people from his weird pro-coal agenda). Melina proposed that due to the presence of the Thin Controller, who governs the Narrow Gauge Line, it’s actually a sign of the Controllers being the Rail Gods – are the Controllers ever seen without the trains? Perhaps this is all they are, representations of the Rail Gods. We have concerns about the OHS standards on Sodor, and questions about cross-pollution. Can they keep their rivers clean when the island’s entire economy is coal-powered? The very concept of being “Very Useful”, emphasised throughout Sodor, is in its very nature insidious. There are a number of class elements embedded across Sodor, with the steamies versus the (dirty) diesels, who are always naughty or bad or bullies. The steamies have white steam, and the diesels black steam. There are few lady trains, and only Emily is named in the credits of the show. She “knows her stuff.” What does that mean? In keeping with this colonialist and imperialist paradise, is she the madame for all the female carriages who can’t exert any self-thingy at all? And why are diesels always evil? Why must their smoke stacks produce black smoke and not white? Why must they be terrible assaulters? All Thomas wants is to be a Really Useful Engine, and a desire to contribute to one’s society is a good thing. However, he’s caught between intra-train politics and the Fat Controller’s seeming unlimited agenda. And what of the Other Railway’s engines? They believe that Sodor is a haven for obsolete engines — indeed, Donald and Douglas go to extreme lengths to avoid being separated, knowing that the twin returned to the mainland will be sold for scrap — and yet their refuge is a lie: they are still at risk of being turned into a generator or a hen house. 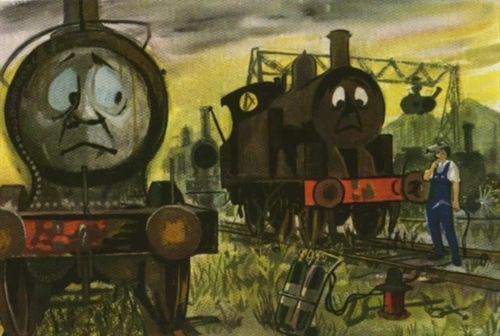 Hiro is left to rot and begs Thomas, who finds him, not to tell the Fat Controller, as it might lead him to being scrapped as he is no longer Really Useful (this, after Hiro having declared himself deputy, much to the Controller’s chagrin and anger). Smudger is carefree and rides roughly, often coming off the rails: and then he is bricked up to become a generator as punishment! IMPRISONED FOR THINKING. All engines are thinking and yet all are constrained by the tracks. Bulgy the bus, essentially a socialist looking to Free the Roads, gets put under a bridge, painted green (he’s a red double decker), and turned into a hen house. What a punishment for a free-thinker and revolutionary! But are we safe on Sodor? Is that the price we pay? …Engines on the Other Railway aren’t safe now. Their controllers are cruel. They don’t like engines any more. They put them on cold damp sidings, and then, they…they c-c-cut them up. Are we being fooled? How is it that all the trains have human drivers and engineers who never know what’s going on or are able to do basic tasks? And finally, when an engine is done, he (always he) just sleeps for a while. Does he wake up again? No one can say. 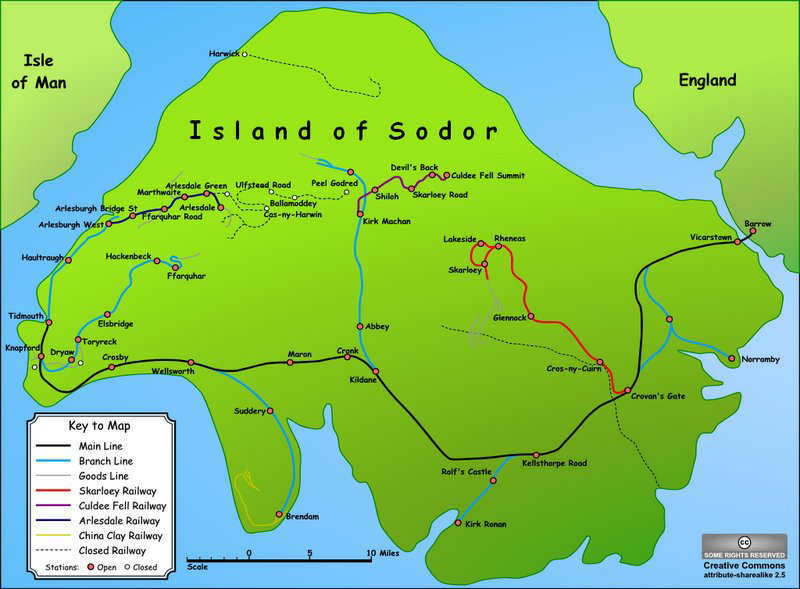 We have a number of questions about the infrastructure of the Island of Sodor that are never answered. How can it support two rail networks? (Query: is the narrow gauge line the Sodorian equivalent of the V-Line?) 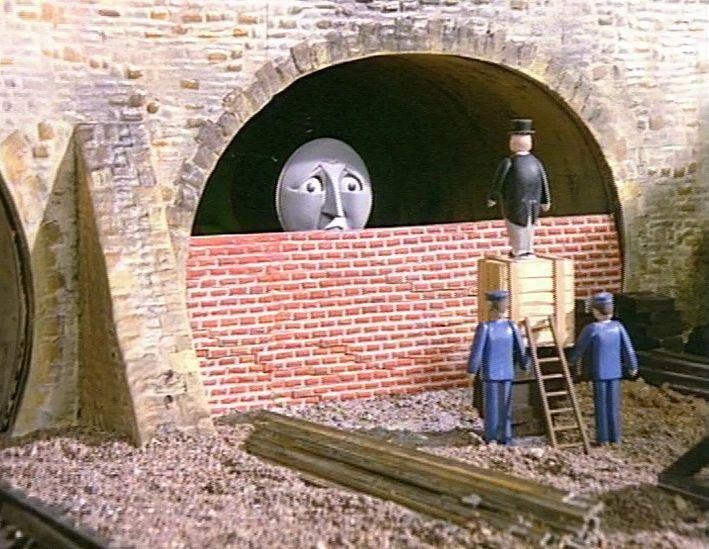 What kind of budgetary oversight is there, that a tunnel is bricked off and an engine removed from service at the whim of the Fat Controller, and then unbricked again when another engine is temporarily out of service? Is Sodor, like some other English Channel islands, an offshore tax haven? Or is the Prison Island theory true? Liz hates Percy, because he’s the Elmo of trains.